WILLIAM L. FOX is a writer, independent scholar, and poet whose work focuses on how human cognition transforms land into landscape. He was born in San Diego and attended Claremont McKenna College. He has edited several literary magazines and presses, among them the West Coast Poetry Review, and worked as a consulting editor for university presses, as well as being the former director of the poetry program at the Squaw Valley Community of Writers. In the visual arts, Fox has exhibited text works in more than two dozen group and solo exhibitions in seven countries, served as the Associate Director of the Nevada Museum of Art, and then as the visual arts and architecture critic for the Reno Gazette-Journal. Fox has published poems, articles, reviews, and essays in more than seventy magazines, has had fourteen collections of poetry published in three countries, and has written ten nonfiction books. He has taught rock-climbing at the University of Nevada, as well as led treks in the Himalaya. 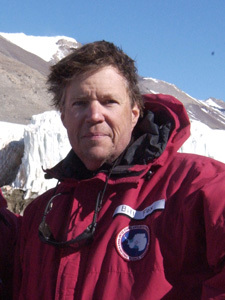 In 2001-02 he spent two-and-a-half months in the Antarctic with the National Science Foundation’s Antarctic Visiting Artists and Writers Program. Fox has also worked as a team member of NASA’s Haughton-Mars Project, which tests methods of exploring Mars on Devon Island in the Canadian High Arctic. He currently is the lead strategist for the Art + Environment initiative at the Nevada Museum of Art.